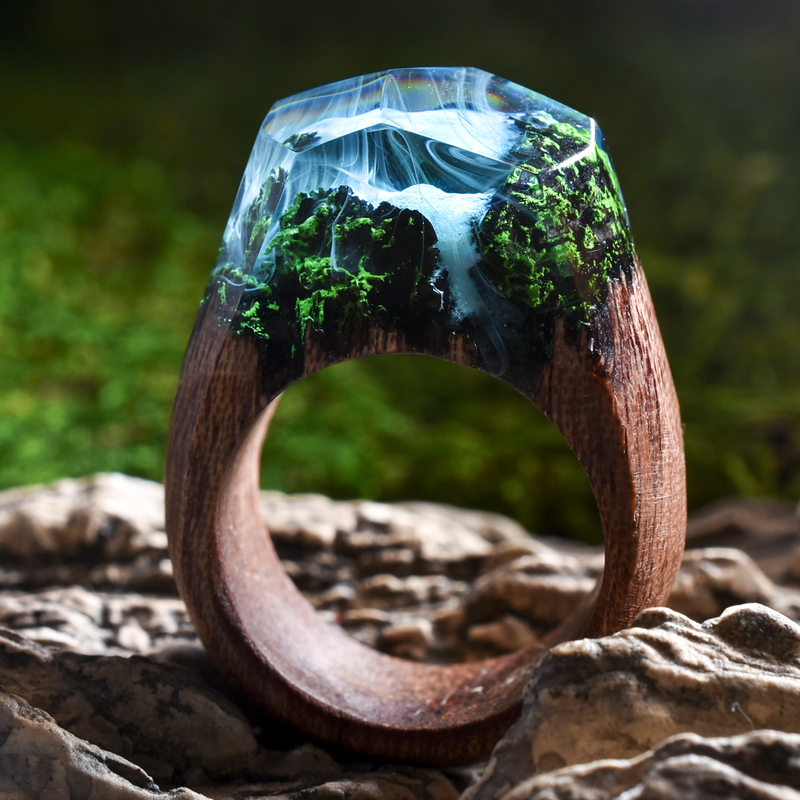 I finally bit the bullet and ordered a Secret Wood ring. 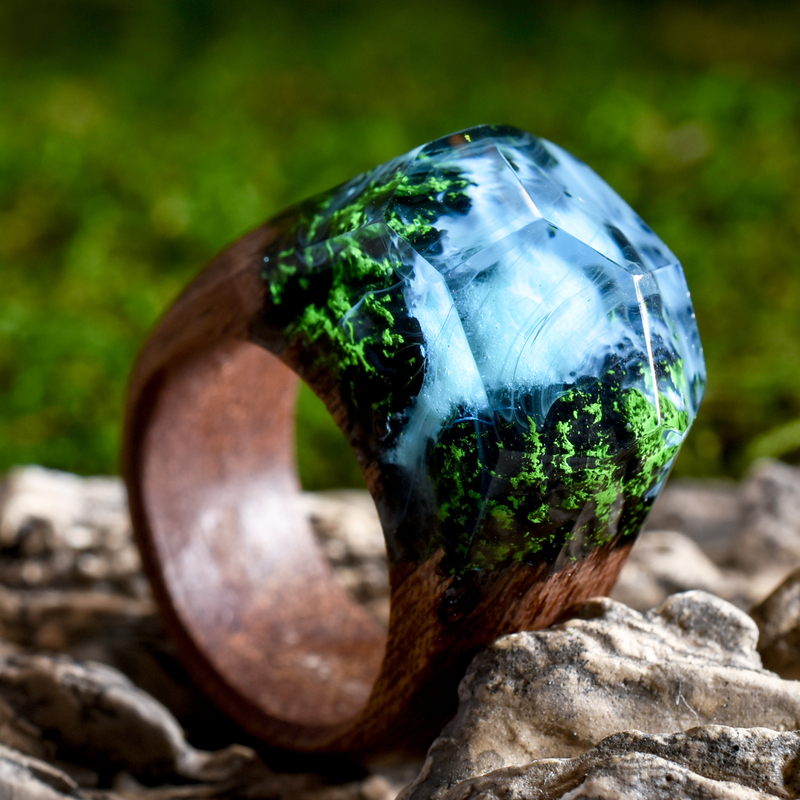 As I previously wrote, I love the Secret Wood website and have lusted after one of their rings for ages. The issue was that I couldn’t decide which one. My choice was narrowed down to these three. 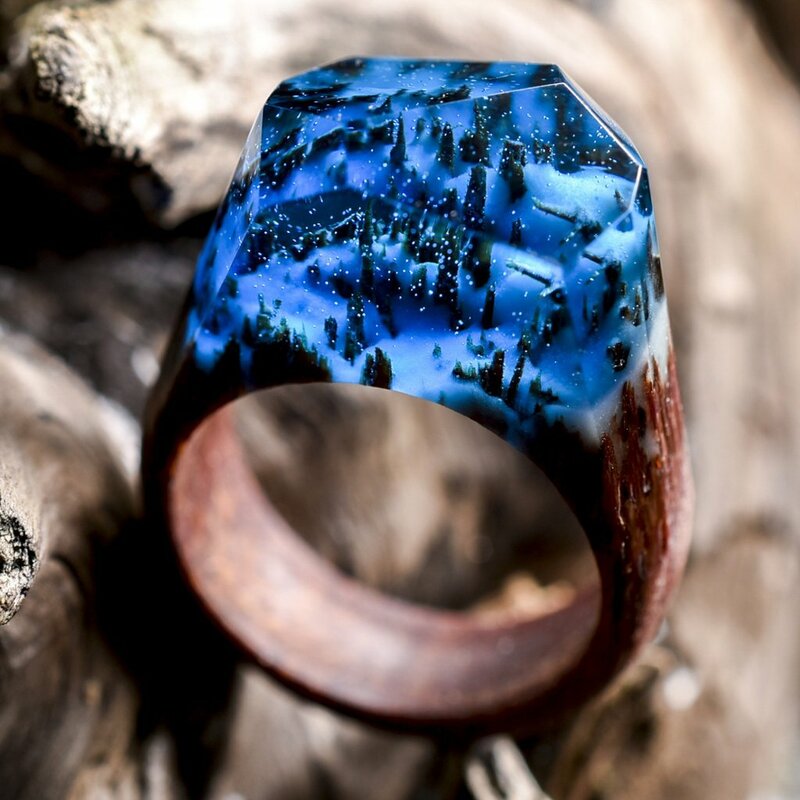 Each ring is one of a kind and made to order (which takes 3 – 4 weeks), so you don’t know what you will be getting until they send you a photograph of your ring for approval. 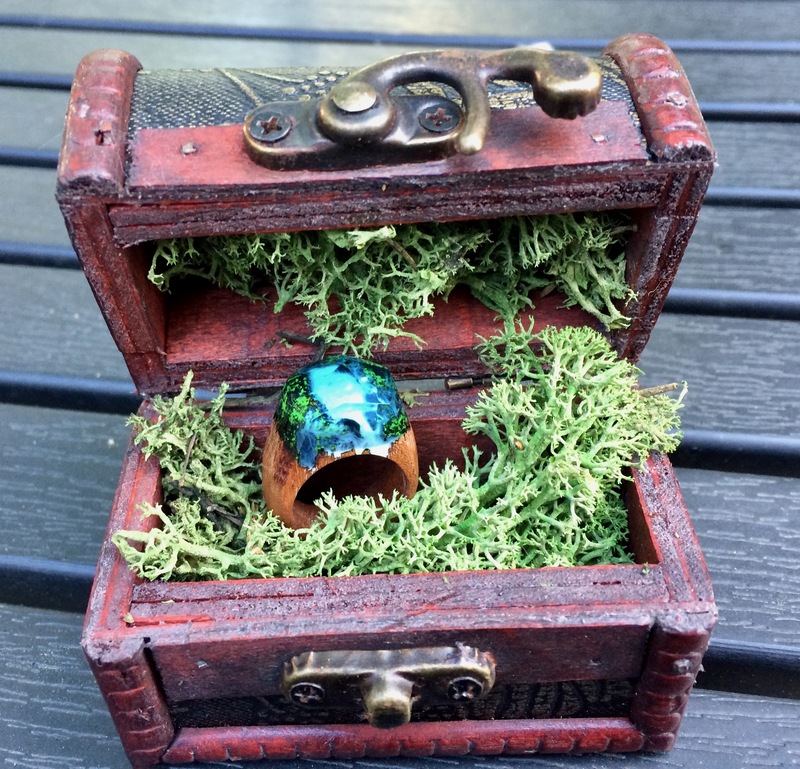 However, there is a lovely new addition to the site – Secret Inventory – where you can find ready-made rings. Each one of these is also one of a kind, you see the photograph of your exact ring, and they ship immediately! The plus side of this is that it is quick AND you can immediately see what you are getting. I found this one and fell in love immediately! Isn’t that waterfall just perfect? It is actually the very one they feature on their front page at the moment (to the right below). 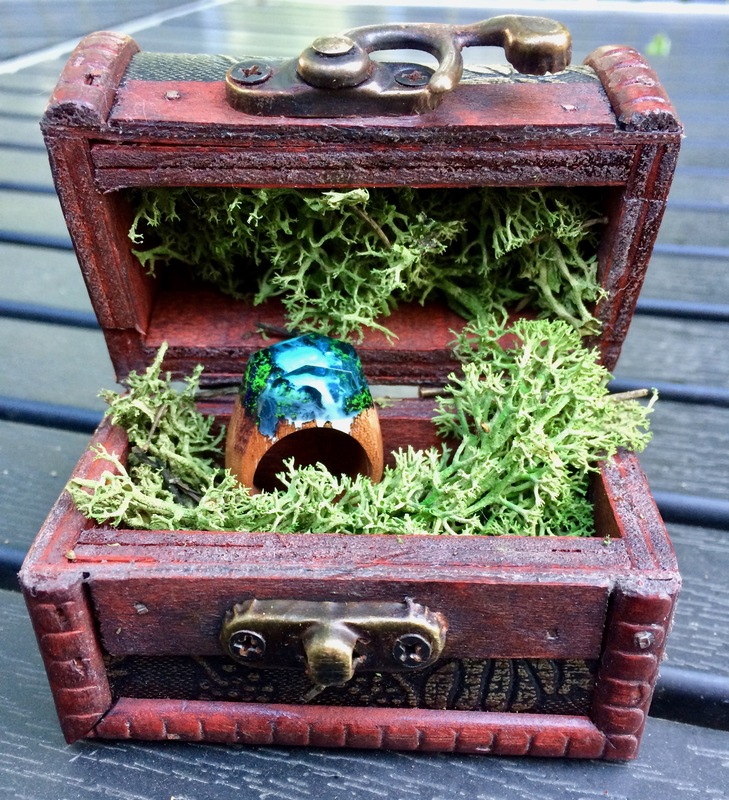 These rings come in gorgeous tiny wooden boxes filled with real greenery (I think it is moss) which smells so so so good! The ring itself is absolutely gorgeous and fits like a dream. My photographs really don’t do it justice. It is truly a work of art. It is beautifully made, the wooden shank base is perfectly rounded and uniform. It is light and comfortable. There is a different waterfall on the front and back. And the ‘water’ glows in the dark! I would say if one leaps out at you on the website, pounce, because each one is different. I fell in love with this one when I first saw it featured on the front page of the Secret Wood site. 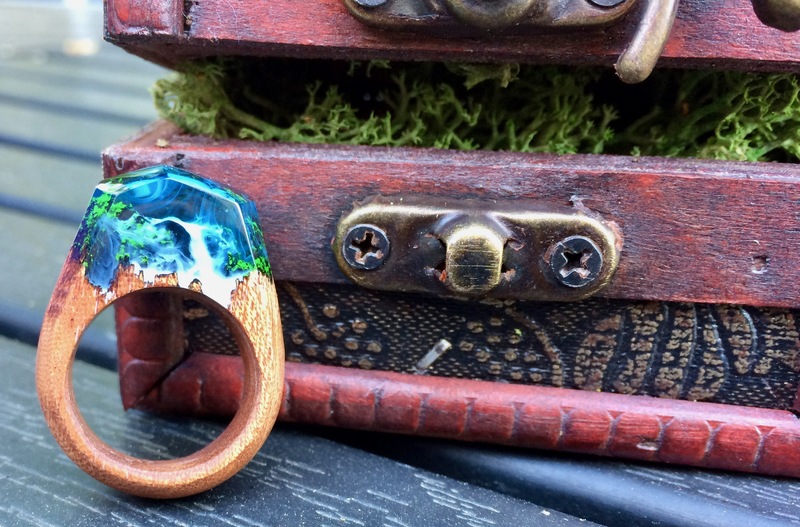 I never imagined the actual ring would be for sale – in my size! I couldn’t get it into focus but I wanted to show it against the backdrop of the forest which is my back garden. I have mentioned in my previous articles how I love the design and layout of the Secret Wood site. I can now add that the customer service is amazing. They sent me photographs for my blog and also were quick to respond when DHL briefly lost track of the parcel in Germany. DHL themselves were stellar in finding where it was and making sure it was quickly delivered. I am mentioning this because you can tell a lot about a company when there are glitches and Secret Wood handled it brilliantly. I was thrilled with this whole transaction! I will keep you updated on how it wears. I won’t be doing anything special apart from avoiding getting it wet for extended periods and taking it off when I am doing anything heavy, like I do with my other rings. I’m seeing this process of uncertainty (paying $160 for a complete surprise!?!) as a chance to see what the universe will send me. 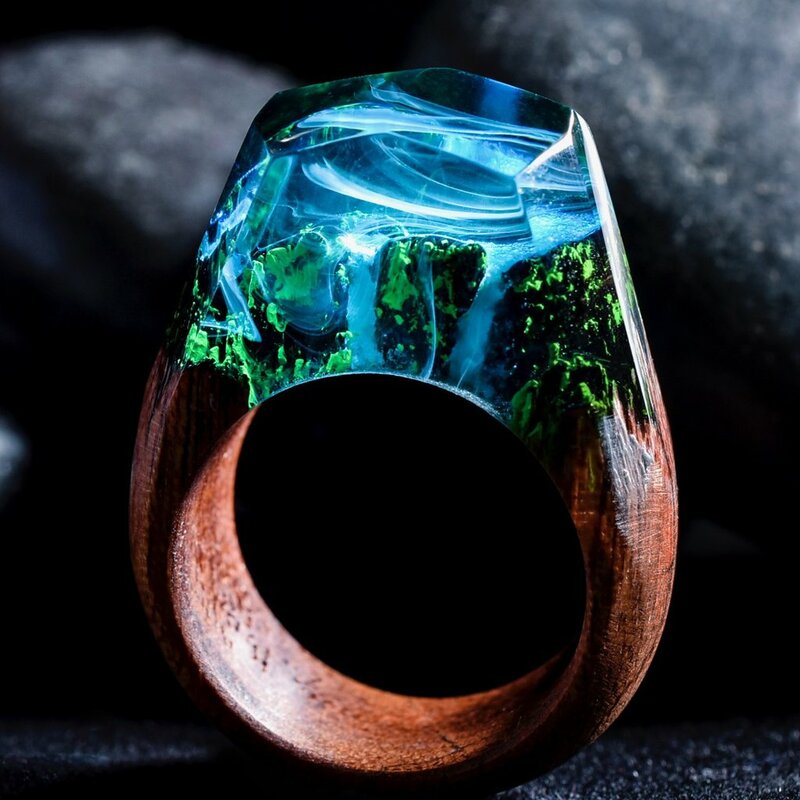 Now I have to stop poring obsessively over pictures of Secret Wood rings and wait patiently! Thanks again for the update on your ring! I am sure you are going to love it! Let me know what you think of your one when you get it. I took forever to decide which one I wanted. It ended up being the waterfall or the Aurora Borealis but the waterfall kept speaking to me! I wanted one with a double waterfall and lots of greenery and kept looking, until this one popped up and it just seemed meant to be. I am so happy with it! You are SO lucky to have that one, Janet! 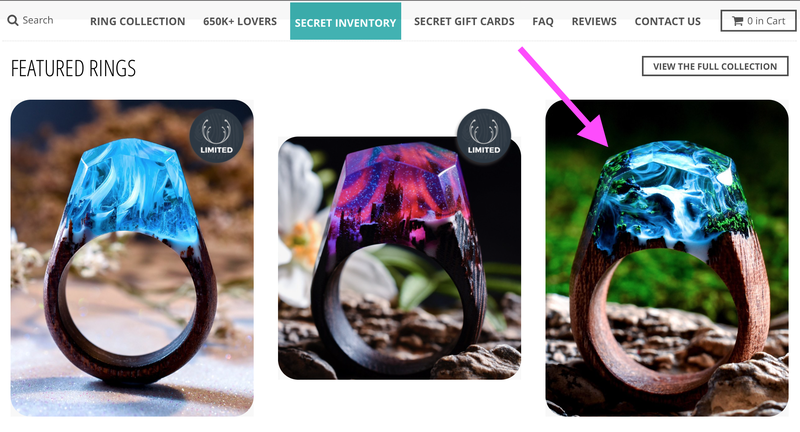 I have to laugh (or cry) because I’d been looking at the Secret Inventory section as well as looking around the site in general, and I fell in love with the image of YOUR ring and thought I was purchasing it as a Secret Inventory item, just like you REALLY did! When my emailed orde confirmation said “preorder” on it, I went back and found my mistake! Wah! 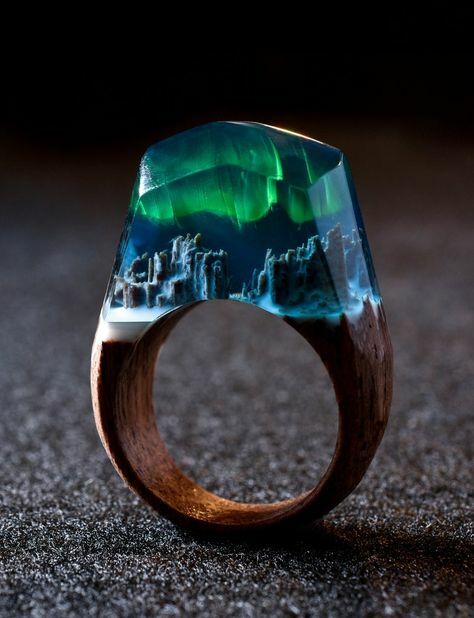 I emailed customer service to ask if there’s any way I could request a largish central waterfall, like in your ring, but I can’t imagine what will happen! How have you enjoyed having the ring? It is so lovely! I hope they can give you a large waterfall! I was going to ask them if they could do a double waterfall and then I spotted THAT one! I couldn’t believe it was in the Secret Inventory section because it is so beautiful. And it was my size! I am loving the ring. It is so unusual and it is very comfortable to wear. 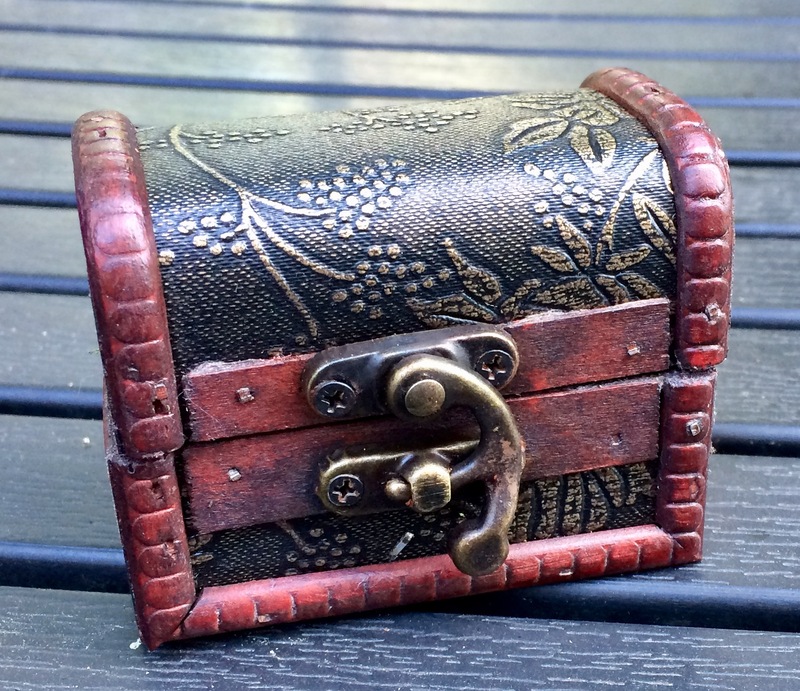 Beautifully made too and the little box it comes in is too divine! 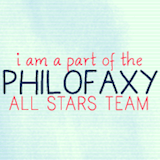 PS I am so glad you enjoy my blog. I write it as a hobby and it always makes me happy if I can help someone!